Summary: Recently, through the formal approval of the State Administration for Industry and Commerce, Shandong China Transport Group successfully registered the trademark of "Ke Yi" and "Cheng Yi". 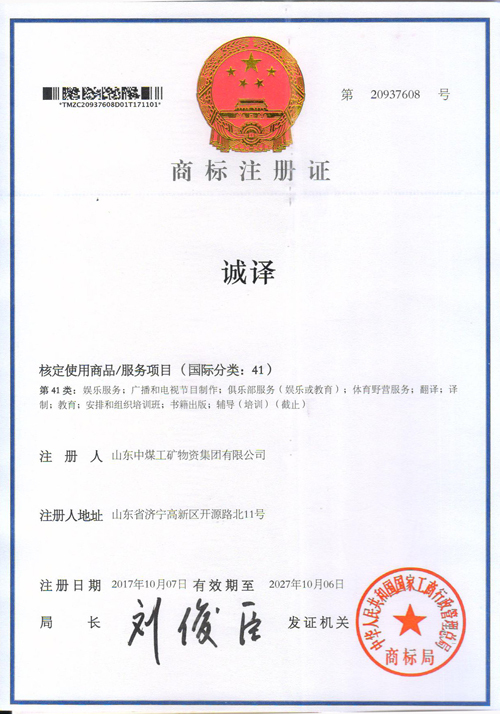 The trademark registration certificate was issued by State Administration for Industry and Commerce, it is a symbol of Group's reputation and quality. According to the regulations, the trademark approval service projects mainly include entertainment services, radio and television program production, club services, sports camping services,translation,education, arrange and organize training courses, book publishing, counseling and training. The registration of two trademarks have great significance for our Group to developing the new business in the next step and safeguard the legitimate rights and interests of the Group. Recently, through the formal approval of the State Administration for Industry and Commerce, Shandong China Transport Group successfully registered the trademark of "Ke Yi" and "Cheng Yi". 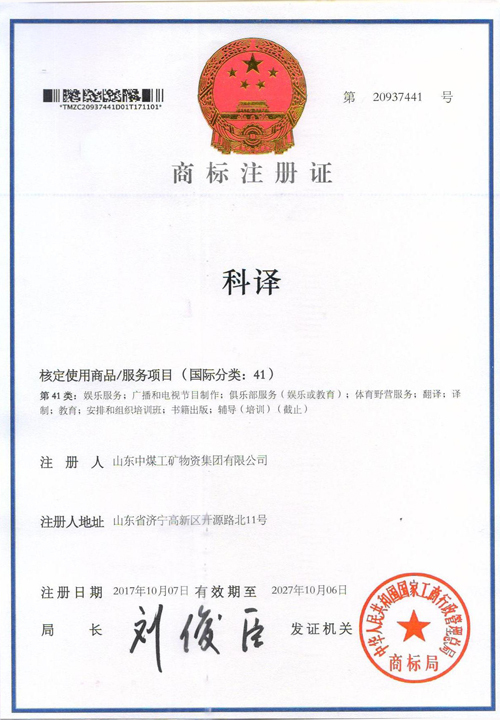 The trademark registration certificate was issued by State Administration for Industry and Commerce, it is a symbol of Group's reputation and quality. According to the regulations, the trademark approval service projects mainly include entertainment services, radio and television program production, club services, sports camping services,translation,education, arrange and organize training courses, book publishing, counseling and training. The registration of two trademarks have great significance for our Group to developing the new business in the next step and safeguard the legitimate rights and interests of the Group. Brand is the most important intangible asset of an enterprise. As an important intellectual property, trademark has become an important strategic resource for the development of enterprises and country and also became a powerful driving force to promote the development of market economy. In recent years, China Transport Group has always regarded trademark protection as an important part of its business, adhere to implement the development strategy of brand , and constantly improve product quality management system, has made a number of trademark registration certificate and intellectual property protection certificate. The successful registration of the new trademark of "Ke Yi" and "Cheng Yi" has played an active role in promoting our group into broadcasting media industry and carrying out translation training services, it is the brand strategy that our group company insists on for many years. The next step, China Transport Group will take this as an opportunity, with forward looking strategic thinking, keep improving technology, high quality service awareness, reliable product quality, strong brand development strategy, constantly increase the building efforts of corporate brand to expand the brand advantages, continue to provide good quality products and excellent service for customers.